Conventional baby showers generate a lot of waste and tend to use toxic products. Just think off all that rubbish that ends up in a landfill after a commonplace baby shower. A clean planet is the most enduring gift one can leave to a child, so start your bundle of joy off right with a eco-friendly baby shower that focuses on the health and well-being of mommy and baby. Look for alternatives to regular throw-away paper that contributes to the devastating loss of our forests. Shower invitations, birth announcements and even thank you cards that are sustainably made from recycled paper are a great place to start. It’s easy to go one step further with fabulous “tree-free”, plantable paper products such as the Little Giraffe Birth Announcement. This cute announcement card can also be used as an invitation to a baby shower and is made from 100% post-consumer waste. Your guests can plant the cards to grow their own wildflowers! Traditional motifs such as balloons and plastic streamers are not at all environmentally friendly. Instead, opt for a super cute felt banner that is reusable as decoration for the nursery, such as the gender neutral Rubber Ducky Felt Banner 9'. Conventional baby shower favors have gone green with a variety of options, from personalized seed packets and edible delights to plantable paper favor cards in a variety of sweet designs. 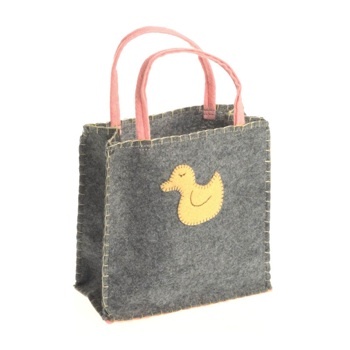 Present each guest with their eco-friendly party favor in a sweet Little Duck Felt Goodie Bag - it’s a reusable alternative to paper or plastic and is sourced from a socially responsible aid-to-artisans trade network. Don’t forget to seat your guests in style with a recycled paper or reusable place card. Place settings can reach the height of earth-consciousness with regular tableware or china, but if that isn’t an option consider sustainably made bamboo or biodegradable tableware instead. Less for the landfill, more for the compost! Over the years there have been horror stories of flammable infant clothing, toxic chemicals in clothing and toys, and conventional diapers that form mountains at the local dump. No mother wants these things for her child! Encourage your guests to purchase gifts made from organic cotton or other natural fabrics. When it comes to baby showers, it’s so easy to be eco-conscious. Whatever theme you plan for the party, rest assured there are options to protect mom and baby from harmful products. Protect mother Earth while starting this precious new life off on the right path with environmentally friendly products for the shower.